What it Really Takes to Prep 28 Crockpot Meals! After following several blogs and pinning many ideas via Pinterest, I finally decided to take on the task of prepping 28 crockpot meals. 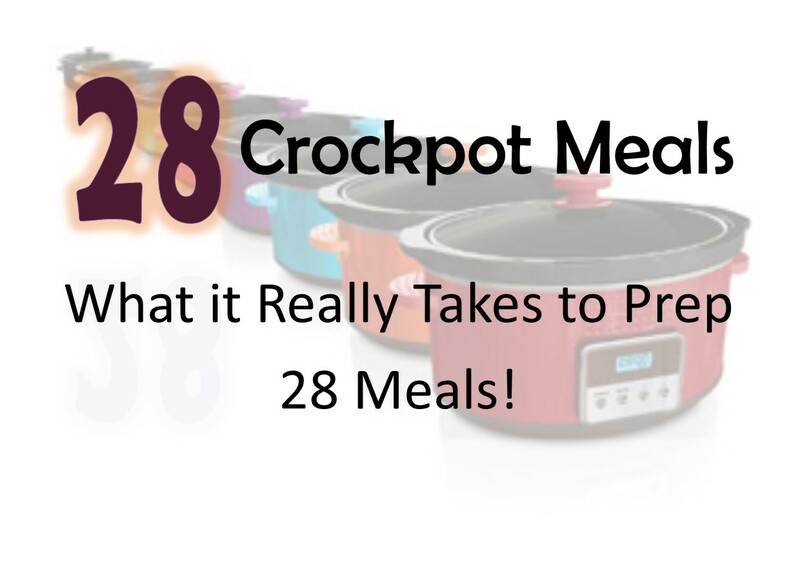 I have to admit, I was lured in by catchy pins that promised I could prep 8 crockpot meals in 75 minutes, or 8 meals in an hour, and my favorite… 28 meals in ONLY 3 hours! I am the proud owner three crockpots that get used quite regularly. I invested in a new 4 quart crockpot for these meals since the portions are more ideal for our family of four. I picked up the crockpot at Walmart for $14.96. Prepping 28 meals took me a whole lot longer than three hours, but was well worth the effort. So, here’s what it really takes to prep 28 crock pot meals. Working full time, I had about an hour every night after work to organize the meal prep. Monday: Pick 14 meals to double and write out all needed ingredients. Tuesday: Inventory ingredients and create grocery list. Wednesday: Pick up canned goods during lunch. Thursday: Write on titles of meals on 1 gallon Ziploc freezer bags. Prep and organize kitchen. Friday: Pick up meat, produce, and new crockpot. Why did it take 10 hours? I didn’t waste time, have any blunders, get sidetracked, or waste time. I strategically and efficiently got through the process, but it just took that long. I started the morning at 5 a.m. by chopping onions, carrots, peppers, potatoes, and celery. I wore swim goggles to chop 8 lbs of onions. So glad I don’t have a picture in my pajamas chopping onions with bed head and goggles. First, I prepped all the chicken meals, one recipe at a time. After prepping the chicken meals, I thoroughly washed anything the chicken came in contact with and then moved on to the pork recipes. Last, I prepped all the beef recipes. The last recipe (ground beef chili) required that the ground beef be browned. After browning the meat and prepping the last meal, I cleaned up the kitchen. From beginning to end on Saturday it took me 10 hours and I was left with sore fingers, a tired back, and lots of yummy meals. It takes time to measure out ingredients and divide into bags. It also takes times to rinse cans of beans, handle raw meat as safely as you can, and seal Ziploc bags. Would I do it again? Absolutely. I will not take on 28 meals though. I reached my breaking point about eight hours in and was completely worn out. I did bite off more than I could chew on this first attempt and going forward I will stick to eight recipes or less. Where did I store it all? Our family of four lives in a cozy 900 square foot apartment and we have a small chest freezer on our balcony. All the meals stacked easily in the freezer with plenty of room to spare. Wow seriously setting the bar high! Nice! I honestly thought it was going to take much less time. I wouldn’t normally post about this adventure but though it might benefit anyone who is considering taking on the task.